ALBANY, NY – January 3, 2013 – Jeffrey W. Cannell, Deputy Commissioner for Cultural Education at the New York State Education Department will address the Albany Roundtable on Wednesday, February 13, 2013. Albany Roundtable luncheon meetings are held at the National Register-listed University Club, 141 Washington Avenue at Dove Street in Albany, and are open to the public. 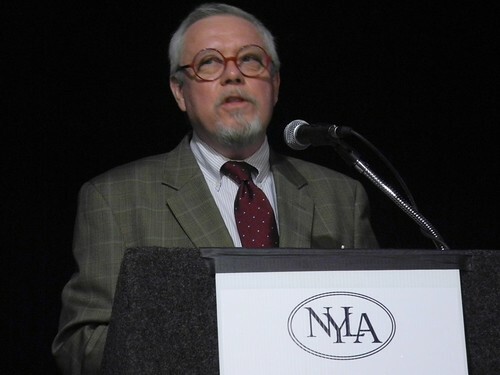 Mr. Cannell was appointed New York’s Deputy Commissioner for Cultural Education in 2007. In that role, he oversees the State Library, State Museum, State Archives and the Public Broadcasting Program. Prior to this appointment, Mr. Cannell served for nearly 10 years as Director of the Albany Public Library. Previously, Mr. Cannell was Director of the Wayne County Public Library in Goldsboro, North Carolina; Manager, Cliffdale Branch, Cumberland County Public Library and Information Center, Fayetteville, North Carolina; Branch Manager of Carnegie Library of Pittsburgh, Pennsylvania; bookseller for a number of enterprises from 1971-1980 and Reference Librarian at Skidmore College, Saratoga Springs, New York. He has a Bachelor of Arts in English and Comparative Literature and a Master of Library Science, both from the State University of New York at Albany. The Office of Cultural Education (OCE) is responsible for increasing the knowledge and information resources of State and local government, businesses, and individuals. The Office supports research, operates programs, and develops collections that serve the long-term interests of the institutions and residents of New York. The Office of Cultural Education provides services directly to individuals and government; distributes aid to libraries and library systems, local governments, and public broadcasting stations; and provides instructional television services through the Public Broadcasting Program. For one month only, the Roundtable Raffle returns! Drop a business card to win a pair of tickets to help eba celebrate their 40th anniversary at the Ruby Cabaret on Saturday, March 2 at 7 p.m.! The cost for the luncheon is $20, which may be paid at the door. The Roundtable is also offering its guests the option of paying in advance with a credit card at www.albanyroundtable.com. The University Club will serve a hot and cold buffet from 12:00 noon to 1:00 p.m., with the program commencing at 12:30. Reservations for the February 13 luncheon are required by Monday, February 11 and may be made by prepaying online, by calling 518-431-1400 (the Albany Colonie Regional Chamber of Commerce) or by sending an e-mail to albanyroundtable@yahoo.com .